Your institution may be running a volunteer program that includes pools of volunteers assigned to solicit for a particular initiative, and you may only want to display a specific set of giving information to those volunteers. For example, say you only want to show athletic giving to volunteers soliciting on behalf of the Athletic Foundation and not a prospect's entire giving history. This is where EverTrue's Giving Categories come into play! EverTrue offers the ability to import different Giving Categories and set the category you want to display for each Volunteer Pool. 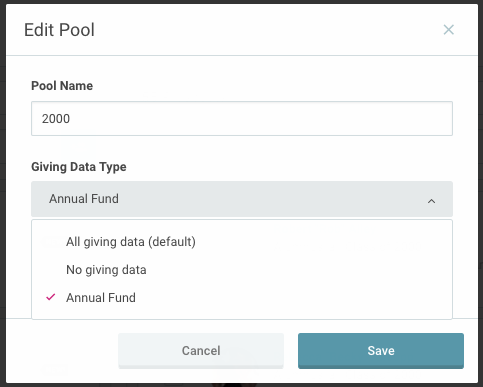 Once your Giving Categories have been added to EverTrue, go to any Pool's Settings and select the Giving Data Type you'd like to display. Only one giving type can display per pool or you have the option to hide giving information altogether.